begins with a picture book story read aloud describing the process of the apple harvest. This will be followed by a tour of our retail store. After the inside tour, your students will be led on a walking tour of the orchard while learning about the different trees and varieties of apples. As a special treat, each child can pick their very own apple to enjoy! area is available for your use if you wish to pack a lunch or just a midday snack for your class. This fun and educational experience, geared toward Pre-K to 3rd graders, has a base fee of $1.50 per child. We have other packages available for you if you so choose. Package 1: Basic walking tour plus apple $1.50 per child. Package 2: Walking tour, apple and small pumpkin $3.50 per child. 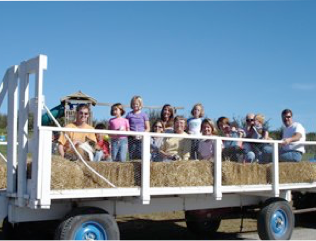 Package 3: Hayrack Ride tour, apple and small pumpkin $5.50 per child plus $2.00 per adult that rides along. Please call or email us for further information. Contact person: Stacy.